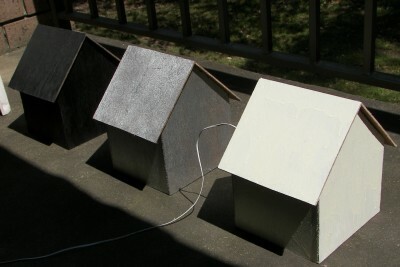 These experiments confirm that the color of the house may significantly affect the temperature inside. My school was going to participate in a science fair held by a science organization. The science project/fair was called The CSIRO Crest Awards. For everyone in stage three (grades 5 & 6) it was compulsory, though we still the choice of doing the easier orange level or the harder blue level. We needed to pick a level that we could do, and not one we just wanted to. The Orange level consisted of choosing an already worked out project from a list and doing it to see if you would get the same result as the previous time it was done. Blue consisted of choosing a category of technology or science and then thinking of a problem or question to do as a project. We had to have a project we could complete in 3 weeks. I chose blue, and the next step was to choose a question to work with. After some brainstorming with my dad, I decided on 'Does the color of the house affect the temperature inside?' since I have always been interested in houses and wondered if there was a specific color that was best for all the seasons. But before I could decide on it, I needed to answer these questions to see if I could manage the project without much help. Hypothesis: The color of the house does affect the temperature inside. Aim of Experiment: To find out if the color of the house affects the temperature inside. Does the color of the house affect the temperature inside? Is there a specific color that keeps your house warm inside when it's cold outside and cool inside when its hot outside? What am I actually going to do? Build some model houses and paint them with house paint. Then put them outside in different places such as shade or at night, and put them outside in different weather conditions while measuring the temperature inside of the model house with a thermometer fitted inside. I will check and record the temperature inside every two hours or so. I am going to find out if the color of the house affects the temperature inside, and if it does, which color is best at keeping the temperature inside the same. What measurements and observations will I need to take? 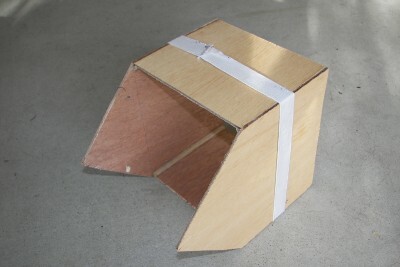 I will have to build my model houses all the same size and put them outside all at once for my experiment to work. I also thinking of measuring the the temperature outside, before inside one of the model houses, and then comparing both temperatures to see if color does matter. It will most likely be an unfair test if I do not do this. What results do I expect to obtain? that isn't hot like black or cold like white, but one that is in between. Which Factors will affect the results? Things like the temperature outside , weather condition and the time of day will affect my measurements . When repeating my tests I will need to have all those factors the same as my previous tests, for them to be fair. I got my things at Bunning's Warehouse and at Big W (in Sydney, Australia). If you were to do the same project as I, you would be able to find most things at a hardware store and a discount variety store. I expect that my results will show that the color of the house does in fact , affect the temperature inside. But it is likely that there won't be a specific color that is good for summer, winter, shade and light/sun. I will try different colors, but I will use one that is of a dark shade, one that is of a light shade and one that is in between .That way I can see if there is a better shade of color that is best for summer, winter, shade and/or sun, than the other shades. Warm colors are or made with red, orange, yellow, or some combination of these. Black is considered to be a 'warm' or 'hot' color, since it absorbs light very well. Cool colors are made with blue, green, purple, or some combination of these. White is considered to be a 'cool' or 'cold' color, since it doesn't absorb light as much as the warm colors. From this information here, I decided I would paint one house white, another black, and the last one a grayish silver.. Grey is considered to be a cool color like white, but by making it silver I will allow it to absorb more light. Also this information mainly only applies to art, but cool colors will always be the lighter than the warm colors. All the results here prove my hypothesis is true, and almost all results fit perfectly. The results in this test show that the color of the house does not affect the temperature inside at night. If you look carefully at this graph you will see that the results don't seem to fit together. This is because instead of testing the houses in the same order every time, I reversed the order the second time round , to make sure that I get the same results every time, no matter what the order. This tests result yet again show my hypothesis is correct, as the results are consistent even if I change the order of testing. By looking at my results I can conclude that the color of the house does in fact affect the temperature inside, but my results also show that it is only true during the day in the sun or shade, and not during the night. But even with that my hypothesis is true. "The color of the house DOES affect the temperature inside". My results can be useful to other people by which color shade or paint a house in order to save money. People that live in a cool climate are best of with a dark shade of color, as it will absorb the suns' rays, therefore warming the house. People living in a warm climate or a very changing one, would be better off with lighter shades of color as it will reflect the suns' rays rather than absorb them, keeping the house cooler. I do not think I need to do any further work or tests as my hypothesis has been proven true with the results I have already collected. During this investigation I didn't face many difficulties. The only major difficulty was when I was doing the test in the sun. I found that while I was waiting for the time to finish, the shade had moved over the house. I fixed this problem by testing in the mornings, When the shade hadn't yet moved over my balcony. By doing that I had stopped the shade from altering my results. 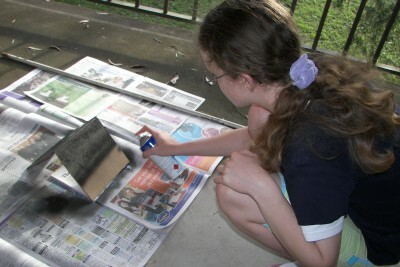 The only person that helped during this science project was my dad, he helped me build, glue and paint the houses. 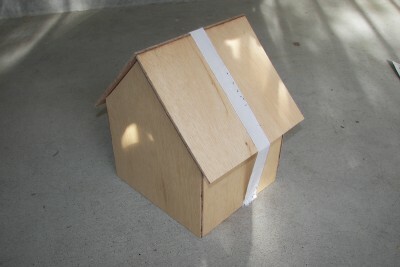 He also gave me the idea of doing a project on houses.